Discussion in 'Console & PC Gaming' started by GTPNewsWire, Mar 6, 2018. This article was published by Joe Donaldson (@Joey D) on March 6th, 2018 in the Gravel category. Bit harsh, and if you thought 39.99 was bad in the UK its selling from $59.99 to an insane $64.99, for that sort of price it should include the season pass! That was a pretty harsh review. I’d give it three or four stars. But then again I think GT Sport is the best thing since sliced bread so maybe my standards are lower. Also what’s with such a low sound design score just for a crappy announcer? That part of the review was kind of dumb imo. Pfei, SZRT Ice, torque99 and 1 other person like this. "DiRT 4 is a game that makes you drive next to the same rock 2000 times to complete its career mode... 5/5 out of stars, best game ever, Colin McRae still a legend." - Joey D, 2017, probably. I must also add I really don't agree with this review, at least in its current state. Sure, the presentation was flaky at release but the more time I've spent with the game, the more it takes me back to off-road racers built with fun in mind, rather than realism. Titles such as DiRT 2, Rallisport Challenge and Shox Rally. Personally, I think this game is a 3.5/5 minimum. And are you complaining about having to complete races to unlock things in an arcade racing game? dzumaalcapone, Quakebass, Pfei and 2 others like this. The announcer can be turned off, by the way. I turned it off right when I started the game and never had to hear it. Otherwise, yes, the sound in the game is one of the biggest issues, I think. Some cars are simply too quiet. I don't disagree with the review, it's not a perfect game, certainly not at it's current price range, but at the end of the day its a fun game to pick up and play and the old school arcade feel is a nice thing to see these days. Pfei, torque99, Joey D and 2 others like this. Is it a harsh review? Yes. But this about mirrors my opinions with regards to Gravel, and especially to a lot of the titles that Milestone has been releasing barring the MXGP game. Even with the switch to UE4, the game looks like crap, something that has dogged Milestone games for years now and shows no sign of improving, and in an age where graphics are an important selling point to people, even more so with Xbox One X's and PS4 Pro's on the market, Gravel simply doesn't look good no matter which way you slice the onion. Sound is also terrible as well. Really glad @Joey D raised the point of price as well. Here in Canada, compared to every other AAA release priced at 80 bucks, Gravel is 60 bucks. Even with a '''''''''''budget''''''''''' price, I still wouldn't recommened this game because there are problems that Milestone seem ignorant, or unable to fix, graphically, in the sound department, or just the general feeling that their games are punching way above their weight class. And while that underdog act is nice, by now, I'm getting tired of seeing the same problems that I saw in SLR Evo, and both Ride games, crop up in this title. ron24, torque99 and Joey D like this. In the interest of transparency, I should point out that the scores changed very slightly right after the review was published. There was some talk back-channel going on, and the graphics/online sections both gained a half star each. The game still averages out to 2.5 stars in the end, but it's a true 2.5 now instead of a round-up (it averaged 2.3 in the categories before). Here's how our rating system works. Ah, so instead of any sort of constructive criticism about an aspect you don't agree with, you just jump straight to that. Classy. I've drawn a comparison between reviews and the Cool Wall before, and I think it stands here too. Surely as gamers we all have a few guilty pleasure titles. Titles that aren't exactly known for their quality, but we enjoy them. I had an NES game as a kid called Totally Rad, and it was a steaming hot pile of '90s-ness. My sister and I still played the crap out of it though. Gravel doesn't have a huge amount of content on offer. It's online features are fairly basic. The graphics don't match many of the other titles in the genre. Neither do the sounds. On our rating system, that means it just won't achieve a higher star count. But it can still be fun! The amount of time I've sunk into (and enjoyed) in the racers I've reviewed over the years does not necessarily align with the review scores I've handed them. Lubeify100, torque99 and Joey D like this. Oh I agree. I don't think one's personal enjoyment level of a game should translate into a higher review score or anything like that and I didn't mean to imply that in my post. I agree 100% with the review but still find the game fun. silverman_GT, ron24, torque99 and 1 other person like this. If you want some CC here you go. Why the heck is a dumb announcer (that can be turned off, mind you.) taking priority over engine sounds in a racing game review? Is it really so bad that an optional announcer needs to be prioritized over engine sounds in the summary of the review? How about giving the engine sounds more priority? That’s certainly more important and is more representative of sound design than an announcer! I do actually think Gravel is a fun game, however it's pretty short and its far to expensive for what you get. On sale for $20 or plucked from the used section at GameStop, it'd be well worth it. But for 50 bones, there's better games to spend your money on. Nah, I didn't really like Dirt 4 all that much, Dirt Rally is fantastic though. Oh and McRae is still a legend. And are you complaining about having to complete races to unlock things in an arcade racing game? Really? Nope. My only complaint was that not everything is fully unlocked in "free play". I'm totally cool with it being locked in career mode. I wrote an entire section about the sound, not just one line in the review box. The only good thing about the sound was the engine noise when in chase cam. Everywhere else it was either awful or sub-par, including the music and the non-existent engine noise when in cockpit or bumper cam. Since many sim-racers have full cockpit and wheel setups, chances are they'll only ever play in one of the those camera modes. Not being able to hear the sound is a big hit. Lubeify100 and silverman_GT like this. Then if the announcer isn’t the thing that singlehandedly destroys the audio, then why is that presented as the main point in the summary? I've played a fair number of arcade racers so I am more used to the system of having to progress in order to obtain more content. Even when things are accessible in free play, I would rather wait until I can unlock it in career mode just so that I have something to work towards. 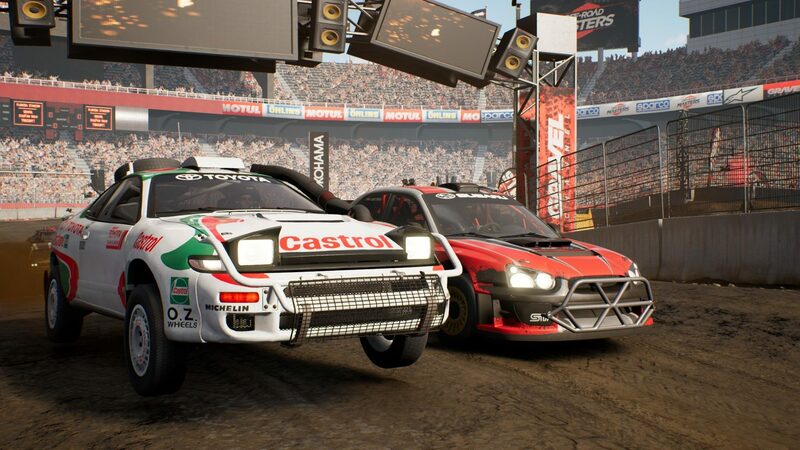 Split/Second uses an identical system to Gravel when it comes to unlocking tracks - You must complete a campaign event on a track before you can use it in custom race mode. I just think it helps extend the longevity of the game rather than having everything handed to you from the get-go. SZRT Ice and torque99 like this. Good news people theres a demo on PSN! The demo is unpatched so keep in mind that the full game version 1.04 has many improvements, mainly in the graphics. Jay84 and FT-1 like this. Very good to hear this, I kinda like it, but yeah wont be paying full price for it and it never should have been £40-45 in the uk. Ouch that review is going to hurt.